Random Number Generator or better known as RNG is computer program which is used in online casino or in electronic machines in order to generate spontaneous numbers or sequence. In land-based casinos the games that work with the help of RNG are often called random number games. To them belong very well-known Slot and Video poker machines. Some gamblers consider that slot machine is the same as video poker one. The external outlook, indeed, of these machines are quite similar, both of them are coin operated, have a lever or buttons but the concept of the game is different. RNG is more unpredictable in slots rather than in video poker machines, what makes slots the basic game of chance. 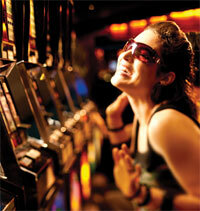 According to statistical data, house edge at slots varies from the 2% to 15% depending on the type of the machine. The RNG program in slot machines is designed in the way that the payback percentage varies from 83% to 97%. Video poker machine replicates gaming cards, like in a real game dealer does. It means that the player can mathematically determine the odds of each hand and simultaneously figure out payouts and the payback percentage. Besides, casino can vary the payout schedule of video poker machine what is impossible to do in slots. To play video poker, gamer has to know rules and have particular skills. Both video poker and slot games can be played not only in land-based casino, but also online. People prefer playing these games in online casino because it gives particular advantages such a comfort. Perfect graphics bring online slots and video poker closer to reality. However, as practice shows, land-based machines take an advantage and are more enjoyable because of flashier lights and sounds. There is no need for slot games to be practice online, because they are very simple. This reason draws an attention of many newbies.